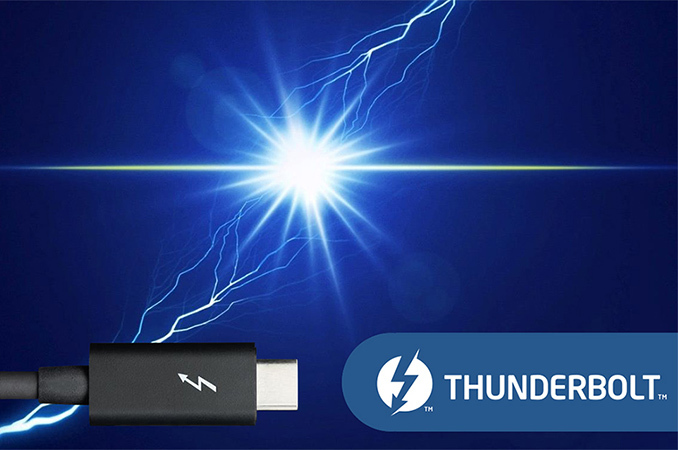 Intel this week announced plans to discontinue its first generation Thunderbolt 3 controllers it launched in 2015, coming as a consequence of an industry transition from leaded to lead-free components. The company has had newer controllers in its fleet for quite a while, so it should not be a problem for PC makers to switch to them as they migrate to newer Intel platforms, such as Cannon Lake or Coffee Lake. Intel on Thursday published plans to discontinue its DSL6340 and DSL6540 TB3 controllers it released in Q3 2015. Intel’s customers should place their orders on the chips by February 2, 2018, and the final shipments will be made by August 3, 2018. Replacing the DSL chips, Intel is advising its customers to instead use the JHL6340 and the JHL6540 controllers that were launched back in Q2 2016. At first glance, there is no difference between Intel's DSL- and JHL-series Thunderbolt 3 controllers: both belong to the Alpine Ridge family and even their power consumption is the same: 1.7 - 2.2 W depending on port configuration. Intel has also confirmed that the DSL- and JHL-series TB3 controllers are similar in terms of features and functionality: 6340 supports one Thunderbolt 3 port, whereas 6540 supports two Thunderbolt 3 ports, every TB3 chip carries two DP 1.2 streams and so on. Meanwhile, there is a difference between how different families of Intel's Thunderbolt 3 controllers are made. The DSL-series controllers use a lead-containing solder alloy, whereas the JHL-series use a lead-free solder alloy based on tin, silver and copper (such alloys are called SAC - Sn, Ag, Cu). The European Union restricts the use of lead (as well as many other hazardous materials) because its fumes increase risk of lung and stomach cancer, along with the other known risks of lead exposure and heavy metals in general. So, as it appears, Intel is EOLing its first-gen Thunderbolt 3 controllers as part of the broader effort to phase out the use of lead in electronics products. Uh huh, all that lead from electronics solder is killing people left and right. They used to drink water from pipes made of it. They cooked things in it and put it in earthenware. Later they disposed of used batteries in landfills and had it in paints. That's when it caused problems. Now they try to make correlations at such sensitive levels that there are more hidden variables than they can possibly control. Actually lead is of little health risk to people over the age of 25. It is primarily linked to developing brain disorders. Your brain starts to naturally deteriorate once you are in your late 20's. Actually your whole body starts to deteriorate. That isn't true. He continued to make discoveries but I'll let you read it. In 1905, Einstein was awarded a PhD by the University of Zürich. The same year, his annus mirabilis (miracle year), he published four groundbreaking papers, which were to bring him to the notice of the academic world, at the age of 26. Einsten was a plagiarist and a chess piece in the political games of scientism. Regardless of what claims the media makes, his work never resulted in the invention of anything practical. General relativity was done in a few months by a guy who wasn't even a physicist, the prominent mathematician David Hilbert, who cracked it in zero time while Einstein did zero progress in like a decade. The reason Hilbert did not push to get recognition is it wasn't really worth the trouble, he already had enough recognition he could have actually lost had he pushed to interfere with the political agenda of scientism.